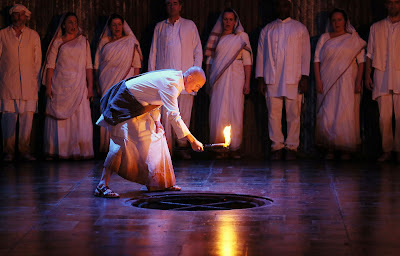 The first performance of this production of Philip Glass's Satyagraha by English National Opera (ENO) (intelligently directed by Phelim McDermott assisted by Julian Crouch responsible also for set design) fell in April 2007 and celebrated the 60th anniversary of India’s independence from Great Britain as well Philip Glass’ 60th birthday. 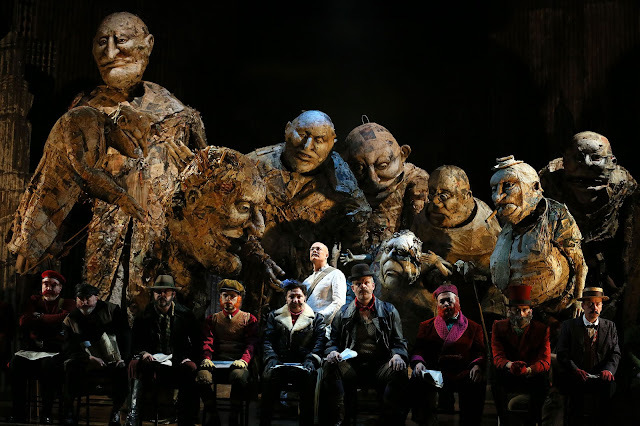 For this revival (seen 14 February 2018) the production was conducted by Karen Kamensek and featured Clive Bayley, Charlotte Beament, Nicholas Folwell, Stephanie Marshall, Anna-Clare Monk, Andri Björn Róbertsson, Toby Spence, Sarah Pring and Eddie Wade. 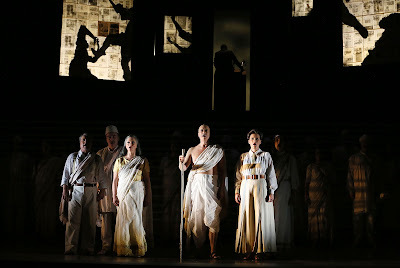 Forming part of a trilogy comprising Einstein on the Beach and Akhnaten, they all tell about men who have changed the world and, therefore, Satyagraha (a Sanskrit word meaning ‘truth-force’) is most definitely about politics. The scenario surrounds Mahatma Gandhi’s early years in South Africa (from 1893 to 1914) and his development of non-violent protest into a political tool. His philosophy was such that it galvanised a whole political movement in South Africa which later greatly influenced the work of Martin Luther King Jr. The text - adapted by Constance DeJong from The Bhagavad-Gita - a sacred Hindu scripture (part of The Mahabharata) translates as ‘Song of the Blessed Lord’ to which Gandhi referred to daily for his well-being and spiritual refreshment. A mesmerising, thoughtful and deeply-spiritual work, Satyagraha calls for nine soloists who performed brilliantly and, indeed, were brilliantly headed by Toby Spence as MK Gandhi plus a very large chorus who were extremely well drilled in Sanskrit by ENO’s répétiteur. One has to remember that they are used to singing in the vernacular! The sweeping soprano voice of Charlotte Beament was heard to good effect as Gandhi’s secretary, Miss Schlesen, but one of the highlights for me was the casting of mezzo-soprano, Sarah Pring, as Mrs Alexander, a European friend of Gandhi. It’s here that white colonial authority stepped in to save Gandhi from the Afrikaner mob in a most moving and humble scene. Glass scored the work simply for strings and woodwind and the repetitiveness of the score brought more than a calming influence to the work as a whole while complementing the quiet and non-forceful style on how Gandhi viewed life and politics. The orchestra worked well under the baton of Chicago-born conductor, Karen Karnensek, who imposed and controlled a strict tempo that’s a pure necessity when dealing with such a minimalist composer as Glass. 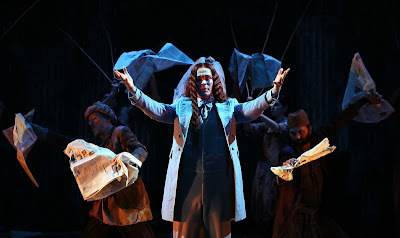 Incidentally, Ms Kamensek made her ENO début conducting Philip Glass’ Akhnaten in 2016 which won the 2017 Olivier Award for Best New Opera Production. But over the years she has frequently collaborated with Glass and conducted the recording of the composer’s Les Enfants Terribles for the Orange Mountain Music label. The work (a dance/opera) is the third in Glass’ trilogy of works inspired by the writings of Jean Cocteau. 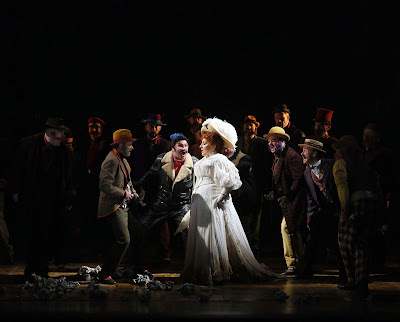 In Orphée and La Belle et la bête Glass experimented with film and music but for Les Enfants Terribles he envisioned something different - singers and dancers sharing centre stage. 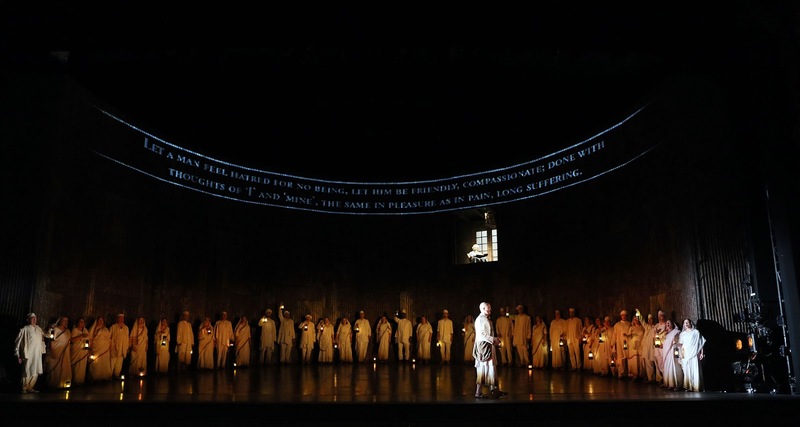 A single set sufficed for Satyagraha comprising a corrugated-board textured surface designed in a semi-circular shape dominating the entire width of the stage. It proved tremendously effective and contrasted well with the quires of unfolded newspapers that were scattered across it realising (and punctuating) the poverty of Gandhi’s era. In act two they were neatly used as the messenger tool of the weekly broadsheet, Indian Opinion. When first produced there was criticism from some quarters of the absence of surtitles. But it’s questionable whether you needed them. You didn’t! And do you really need to know every word being sung? The phrases and words of wisdom flashed regularly on to the set from The Bhagavad-Gita gave you more than an awareness of the scenario. And full marks must go to the twelve-member team of the Skills Ensemble who were simply unbelievable in their craft and pivotal to the stage action at all times controlling a host of giant-sized papier-mâché figures that contributed greatly to a visually-stunning production that used every square inch of the Coli’s vast stage to its clear advantage. And as for the packet-steamer bringing Gandhi into Durban harbour it was video technology at its very best created by Leo Warner and Mark Grimmer of 59 Productions responsible, too, for the multiple and engaging video sequences seen in An American in Paris which has just finished a glorious and heart-stopping run at London’s Dominion Theatre. The first two acts each contain three scenes while the last one is continuous. But each act is dominated by a single historic figure overlooking the action in a non-singing role. The Russian author, Leo Tolstoy, who inspired Gandhi, features in the first act, the Indian poet Rabindranath Tagore (Gandhi’s counsellor) in the second and the American Civil Rights leader, Martin Luther King Jr (Gandhi’s iconic disciple) in the final act. And it was in the final act that provided Satyagraha with the tender-loving conclusion it deserves with the gesturing of forceful words emanating from Martin Luther King Jr (gracefully portrayed by Skills Ensemble member, Charlie Folorunsho) standing on a podium with his back towards the audience addressing a massed crowd of loyal supporters with Gandhi standing in the shadows knowing that his political philosophy is being carried forward to the next generation and, hopefully, beyond. Spence’s final ode was soft, lyrical and thought provoking and sung with a deep sense of conviction striking at the very heart of everything that Gandhi (and his followers) stood for. We shall overcome - one day!